Let me remind you the typical scenario for this service: supplier’s invoice file (image or PDF) is sent to OCR web-service by means of NAV or simply by an e-mail. Service “digests” it and quickly returns the resulting document in the text format (XML) back into NAV. NAV then creates the purchase bill. It is remarkable that in the process of working with OCR, service can be “trained” to recognize different formats from each supplier. The learning procedure however requires the user participation. Luckily the participation is kept to a minimal: it is sufficient to confirm or suggest areas of document that raise questions. And of course the service is able now to “digest” multi-page documents. Lines of products in a printed document are fully translated into a similar product lines of goods in NAV. 1. For those who think that the introduction of the documents to the system by hand is a low-skilled labor, which, however, takes up much of the time of a skilled accountant. 2. For those who have delegated accounting to a third party and are forced to pay for the number of documents enetred or hours spent. 3. For dynamic, mobile companies, in which documents are done by hands of one person – f.e. the owner of the business. 4. Finally, for those who have an understandable desire to continue developing this service for themselves and employ automatic recognition of not just “paper” invoices, but also of commercial offers, price lists. Mindcore already enjoys it, and we can teach you to enjoy it as well! 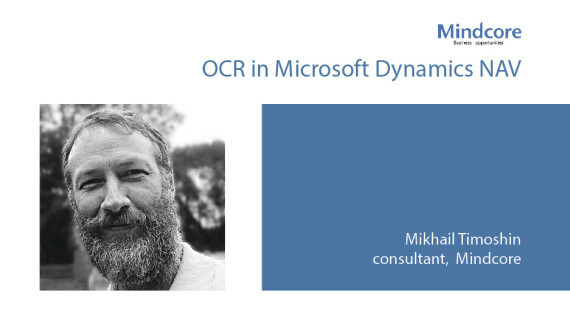 Mikhail Timoshin, Mindcore Senior Consultant.